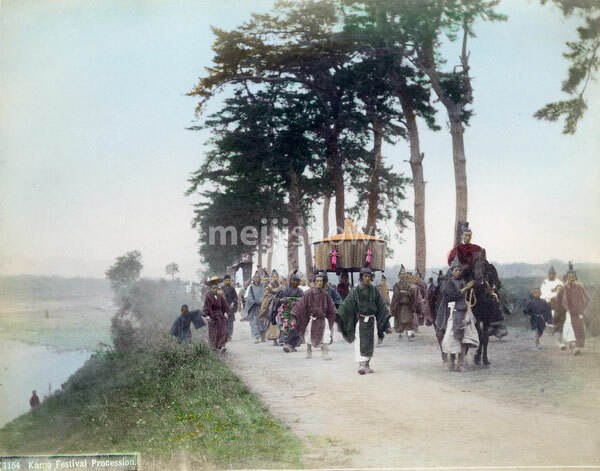 Aoi Matsuri (葵祭), Kyoto, 1880s. According to the Nihon Shoki (日本書紀), Japan’s second oldest book of classical history, Aoi Matsuri was started during the reign of Emperor Kinmei (欽明天皇) who reigned between 539 and 571. Because of bad harvests and epidemics, the emperor commanded that the Kamo deities had to be appeased. These rituals would eventually grow into the Aoi matsuri.